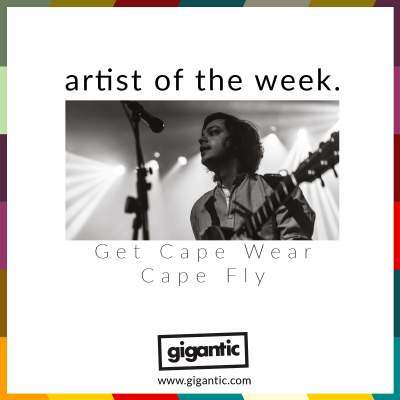 AOTW // Get Cape. Wear Cape. Fly. Sam Duckworth is back! Three years after announcing his plans to hang up the cape, the Southend-on-Sea singer/songwriter has made his welcome return to the stage and studio, much to the delight of his multitude of fans who are drawn to his idiosyncratic and charmingly personable style. This year has already seen the release of his fifth Get Cape. Wear Cape. Fly. album; ‘Young Adult’ which he takes out on tour next month. Working as a solo artist fusing elements of emo, indie rock folk and even electronica, Duckworth adopted the moniker Get Cape. Wear Cape. Fly. and started gigging hard which earnt him a cult following which also included a number of his future peers and an invitation to tour with the likes of OK Go and José González. This saw him promoted from the realms of indie labels to be signed by the major Atlantic for the release of his debut album ‘The Chronicles Of A Bohemian Teenager’ in 2006 which not only saw him receive wide critical acclaim but also commercial success by hitting #26 in the charts and eventually hitting Silver certification. All this before he had even hit his 21st birthday! The coming years would see a flurry of activity for Duckworth, releasing subsequent LPs ‘Searching For The Hows And Whys’ and an eponymously titled album before choosing to drop the stage name as well as much of the electronic assistance and looping he is known for and adopting a more direct song writing approach on ‘The Mannequin’ in 2011. Over the next six years, he would release a further two full length records under his own name, release ‘Baby Boomers 2’ under the alias Recreations and two more albums as Get Cape. Wear Cape. Fly. including ‘London Royal’ which his declared to be his fifth and final album under that title with a farewell gig held at The Forum in Kentish town during the Autumn of 2014. Behind the scenes, Duckworth was both feeling the toll of the years of ceaseless hard work whilst also recovering from a serious illness which dangerously reached a point where it even became life threatening. Nevertheless, he continued to write prolifically and release new material. Earlier this year, Duckworth made the surprise decision to once again take up his most famous mantle and released a new Get Cape. Wear Cape. Fly. album; ‘Young Adult’. Politically charged and laden with left wing polemics, Duckworth would again forgo his typical folktronica sound and recruit the aide of a full band to revisit songs that had been waiting in the wings as early as 2012 which he felt needed a raw and direct feel to them. "I felt I needed a new beginning and that, at the time, felt like ripping up and starting again. Really it was a combination of a break, a shake up and a fresh perspective that I needed. I’m pleased to be back and in a way, it doesn't really feel like I've left." The result is a record which lambasts austerity, a media ruled by media tycoons and details a growing generation gap through gloriously sublime indie pop making for a compelling listen which vital immediate importance. Get Cape Wear Cape Fly tickets are currently available.